At the risk of sounding like a complete and total heretic, I'm not sure I see a point in a prequel detailing how Levi came to be the great Captain Levi of the Survey Corps. He's certainly a popular character among fans, but does he deserve his own manga? The primary series is very much a grand and sweeping epic and its wide scope is what gives it such an appeal. While Eren is the lead character he is surrounded by many characters that are given more depth over time and really grow. Plus there are amazing titan vs titan fights. The question is whether or not this manga prequel is a legit manga or if it is just a cash-in. 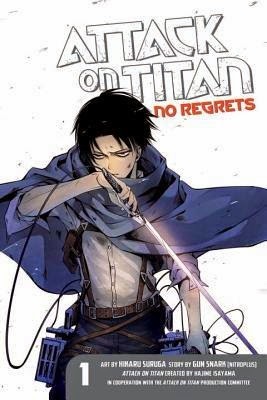 Going back to before the beginning and focusing on Levi, a relatively uninteresting character when he isn't killing titans in amazing fashion and treating other characters like dirt, doesn't seem like an ideal prequel. Certainly of all of the potential storylines a prequel could be made from in the world of Attack On Titan, I wonder if a Levi story is the way to go about making one. I don't know right now. It's early. I have only finished this volume and I must wait for the next entry in the series. The artwork seems different than the primary series, but that is because the artwork is done Suruga Hikaru. The original artwork by Mr. Isayama has a much more unique feel to it. No, it's not as smooth as a lot of other mangaka, but Isayama has a very distinct style. Mr. Suruga somewhat removes that distinction in favor of more clarity and sleekness. The characters look more refined, but those that are familiar to us like Levi or Erwin lose a bit of that trademark touch. That's not to say that the art isn't good because it is very good. It just lacks the distinctive style that I have thus associated with Attack On Titan. It's close, but not quite there. This volume is very short and not a lot happens. Well, aside from the fact that Levi meets Erwin and the members of the Survey Corps for the first time. He also gets to battle a titan for the first time. We also meet Furlan and Isabel, two of Levi's friends that are original to this particular manga. This being the series that it is, I doubt that they'll survive for very long since they haven't been mentioned until now. At the beginning of this volume Levi and his cohorts are on the run from the Survey Corps because the stole some 3D Maneuvering Gear. Oddly enough, there's a bonus prologue at the end of this volume that shows the start of the chase. Erwin eventually catches them and tells them that they can either join the Survey Corps or endure a great deal of hardship. Apparently, Erwin sees something in these three that others don't and he's willing to use them in the war against the titans. Levi agrees cautiously, but only because he wants to get close to Erwin and cause him some hardship. This is certainly an interesting start, but it isn't exactly jaw-dropping. I'm going to wait and see what the next volume has to offer.